08.11.06 Round 3 coverage with analysis that lets you get inside the head of a chessplayer: hope, fear, dissapointment and a spectrum of human emotions. As Bobby Fischer once said, "Chess is Life". Also in this report images of the winners of the Polgar Blitz Tournament and Puzzle Solving Championship and Round 4 pairings. I’Äôll be candid: I was very disappointed with my performance in round 3. My opponent played well, but I made it all the easier with one of the worst center-counters that I have ever played and a serious blunder in the opening that cost me the game. At first I considered not including this game in my journal, but finally realized that there must be some humor in the chess world, and this game is, if anything, filled with it. Many of my moves were nearly laughable, and the fact that I did not resign even when my opponent was one move away from checkmate still puzzles me now. The below game is accompanied by the usual analysis which is, I must say, a bit more critical than usual. There, another error on my part! And this is only the third move! I should have played the normal, book-suggested response of Qa5 ’Äì the move that I always play. Instead I attempt to be creative and throw in a needless check! It could have been worse, I suppose, I could have gone 3’Ä¶. Qc6 and lost my queen to a pin on the 4th move! I really have psyched myself out for this game. It’Äôs amazing how one’Äôs fear and emotions can take such a mental toll on their brain, and especially how worrying before one’Äôs game can harm your level of play so profoundly. In this case I attempted to a fianchetto when I probably should have done something more standard, like bringing my bishop out to g4. Well, what’Äôs done is done. Already White is way ahead in development. The measly advance of a pawn moving one square and a queen well accustomed to being chased around the board. Here is where I really blunder. I am aware of the knight’Äôs threat of checking and forking my rook on c7 and am also aware that my queen is in jeopardy. Of course, I must move it, but in a place where I am now protecting the c7 pawn. That narrows my choices down to d7 and d8, but I also need to try to prevent the bishop from coming to f6 and on the following move forking my rook anyways. My nerves have taken a hold of me: I am in serious trouble, and it’Äôs only the opening. Forgetting all about the threat of Nxc7, I move my queen to f6 to prevent the bishop from attacking. During previous analysis I have made comments such as ’ÄúWhat was I thinking?’Äù And after this move I think it a sure possibility that I was not thinking and had merely left my brain back in the hotel room. At least my thoughts weren’Äôt so clouded that I didn’Äôt think of closing the knight in. At this point I probably shouldn’Äôt have traded queens, but I felt as if there wasn’Äôt much else for me to do. My pieces pathetically underdeveloped and protection was a word that my army had never heard. Furthermore, my king was unprotected, and the sooner that I rid my opponent of her queen the better. I had hoped that white would play 14. Ne5, threatening another fork on f7 allowing me to retaliate by capturing on g2. If white threatened with her rook, then I would merely retreat with my bishop to d5 protecting f7 and gaining a pawn for my efforts. If White had decided to ignore the threat and continue with the fork on f7, then I would simply move my king to e8 and allow the knight to capture my rook. Then I would be able to return the favor Bxh1 and be able to retreat if needed, whereas White’Äôs knight could not. If White had followed her check with Rg1, then I would have merely capture the knight and it would have been an even trade. However, none of that happened. White moved 14. a3, and I found myself once again forced to withdraw my piece to safety. At this point in the game my notation becomes complete gibberish, and I am not able to recall the moves that followed. It is mostly just a long series of exchanges and me trying to protect myself from an ongoing series of attacks by her rooks and bishops. The game ends with an inevitably promoted pawn and a devastating checkmate. 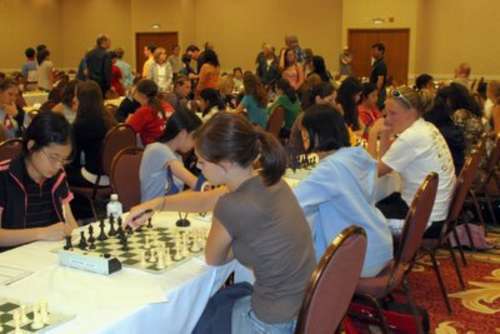 The winner of the 2006 Susan Polgar National Invitational Blitz Championship is Abby Marshall. She scored a perfect 6-0. This is the second consecutive year that she scored 6-0 in the Blitz Championship. I must say, having read all three of Ms. Bryan's comments to her games so far, that I couldn't be more impressed. Here's a young woman with grace, good humor, and honesty, even when she doesn't perform to her satisfaction. I think Maine is exceptionally well-represented at this event. Go get 'em, Margaret!